For a team that was left for dead in the Eastern Conference playoff race 10 days ago, the Florida Panthers are very much alive. The Panthers got a win they had to have on Saturday by rallying from a 2-0 deficit for a 3-2 overtime win over the Sharks, their first win in San Jose in 10 years. 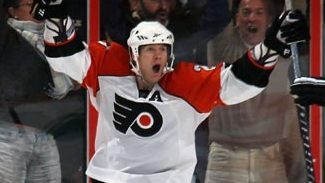 Shawn Mattias scored the tying goal on a backhander 5:01 into the third period, then won an offensive-zone draw in overtime and went to the net to screen Thomas Greiss as Bryan Allen's slapper from the left point sailed into the net. Florida finished 2-1-0 on a three-game swing through the Western Conference and is 4-1-0 in its last five. With 66 points, the Panthers are six behind eighth-place Boston. The Sharks, who set an NHL record by winning their last three games in regulation despite trailing after two periods, didn't fare as well playing from ahead. Ryane Clowe and Patrick Marleau had first-period goals for the Sharks, but San Jose couldn't get another puck past Tomas Vokoun. "The first period, it looked like men with boys," Panthers coach Peter DeBoer said. "Then we found our legs and got our game going and thought we did a good job coming back against arguably the best team in the League." Keith Ballard got one goal back 62 seconds into the second period, and Mattias spun to backhand home a rebound at 5:01 of the third. Meanwhile, Vokoun stopped all 30 shots he faced after the first period. "It felt like we could have had more than two in the first," Sharks center Joe Pavelski said. "In the second period, we didn't get pucks behind them, didn't get in on the forecheck and we didn't get any more shots. We came back a little in the third period, but it wasn't enough." The Sharks did get a point for the overtime loss, extending their lead over Chicago for first place in the Western Conference to three points. Both teams have 15 games remaining. It wasn't the outcome the Sharks wanted as they head to Anaheim for a game on Sunday that begins a six-game trip. "We came out and had a little fire in our belly and played extremely hard in the first period," coach Todd McLellan said. "But we let it get away from us. That's the inconsistency in our game right now. Obviously they heard the message at the start but now we reversed the trend and didn't finish real well. We have to move on." Quick -- who leads the NHL in shutouts? If you guessed Ilya Bryzgalov, you're right. Bryzgalov stopped all 29 Carolina shots for his NHL-high eighth shutout of the season as Phoenix started a four-game trip by blanking the previously-hot Hurricanes. Lee Stempniak and Martin Hanzal each scored twice as the Coyotes set a franchise recor with their 41st win and moved another step closer to their first playoff berth since 2002. The play of Bryzgalov is perhaps the biggest reason for their success. "Just a solid road game," Phoenix coach Dave Tippett said after his team won its fourth in a row. "(Bryzgalov) cleaned up the few chances that we gave up, but other than that we had a real good group effort." Stempniak, who came from Toronto at the trade deadline, has made himself right at home. He has four goals in his last two games and five since the trade after shoveling home a loose puck at 3:59 and firing a wrister from the slot past Justin Peters for a power-play goal 12 minutes later. "(Stempniak's) fit in very well with our team," Tippett said. "He's a hard-working guy. He likes to play the style that we play and is getting rewarded around the net with some real good puck play. He's been a very positive player for us." Hanzal scored once in each of the last two periods, and Bryzgalov did the rest. His best stops came on Eric Cole's first-period breakaway and on Rod Brind'Amour during a 5-on-3 power-play early in the third. "He was good and made saves," Carolina coach Paul Maurice said after his team fell to 13-4-1 in its last 18 games. "He had a bunch that he just made a lot easier than they were. He didn't give any back." Dwayne Roloson made 38 saves as the Islanders beat former teammate-turned-Devil Yann Danis, making his first start in six weeks. For NHL's complete story on the game, click here. The Leafs made it three consecutive victories by winning a battle between the NHL's 29th- and 30th-ranked teams. Phil Kessel had a pair of goals and an assist for the Leafs. For NHL.com's complete story on the game, click here. St. Louis won't go away in the Western Conference playoff race. The Blues shrugged off a slow start in Columbus and overwhelmed the Jackets for their seventh victory in eight games. They're five points behind eighth-place Detroit. After a scoreless first period, the Blues regrouped at intermission. "We certainly weren't happy with the way we were playing," said Blues center Andy McDonald, who had a goal and a pair of assists. "We knew we had to play better if we were going to turn things around. We did that in the second. We put some shifts together where we played in their zone, gained some momentum and we got the goals." During the first intermission, Blues coach Davis Payne said he told his club it had to be more aggressive. "Once we started to make the decision to finish our plays at their net and apply that kind of pressure, we were a much better hockey team," he said. "And that's what we talked about after the first. Sometimes you have to make those adjustments within your game." Whatever Payne did worked wonders. McDonald opened the scoring at 11:20 of the second period, and the Blues got goals by David Backes and David Perron before the end of the period for a 3-0 lead. Alex Steen scored early in the third period and B.J. Crombeen hit the empty net after Jakub Voracek spoiled Chris Mason's shutout bid with 5:41 remaining. The Blue Jackets were without two of their top three scorers. Captain and top scorer Rick Nash missed his third game in a row with a lower-body injury. Kristian Huselius sat for the third time in the last four games because of an upper-body injury. "We chased all game. They had puck possession and we could not get it at all," Jackets center R.J. Umberger said. "We just didn't have the puck at all. It's tough to play like that."